For accurate routing, network connectivity is essential. This is the case regardless of one’s mode of travel. A person may start a journey on foot, move to a bicycle, then to subway and finish off her trip again on foot. Nevertheless, all legs (e.g., street, bike lane, subway line) of the journey, regardless of the mode of travel, need to be connected. In the course of a trip, we may on occasion encounter unusual means of ‘network’ connectivity. For example, we may need to carry our bicycle up a set of stairs to enter onto a bridge. In this post, I will cover what I find to be an unusual means of urban connectivity: step streets – more on the name later. Quite simply, a step street can be considered an outdoor stairway or a series of steps that connect two different elevations. When I think of ‘step streets’ as access ways in urban environments, older European cities come to mind first. Cities with narrow streets and sometimes steep grades that were laid out well before the advent of the automobile. 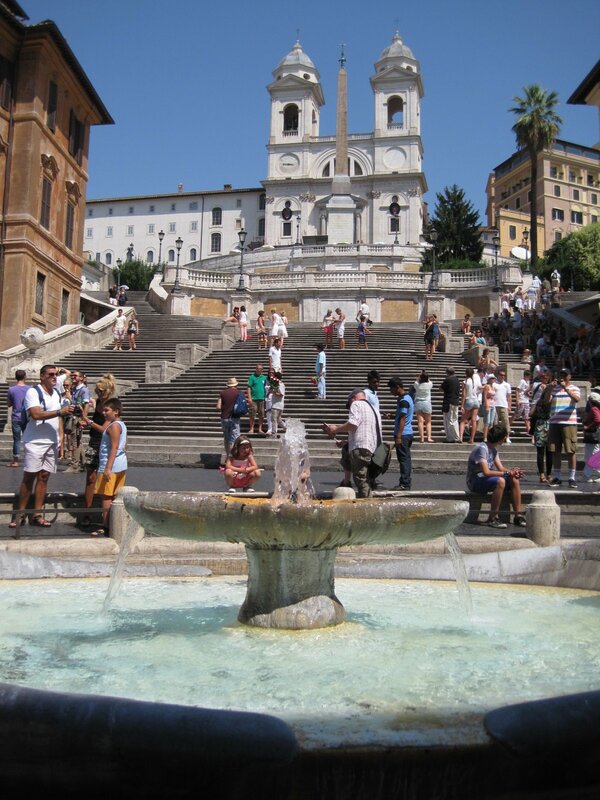 One of the most famous examples, albeit not of a narrow passageway, is the Spanish Steps in Rome that connects Piazza di Spagna and Piazza Trinità dei Monti. 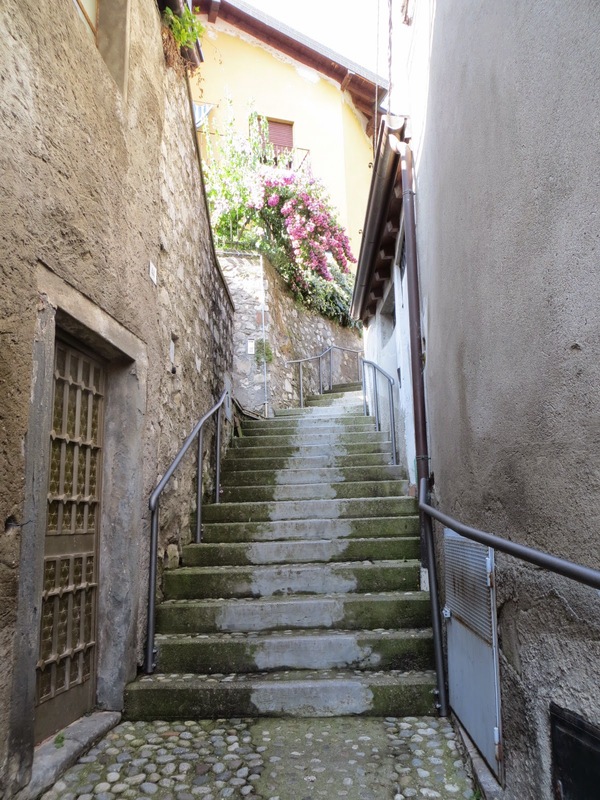 A more classic example, of a steep narrow passageway comprised of steps, can be found in Lago D’Iseo, Italy. You could probably schlep a bicycle up these steps but not much more. In older city settings, stairs or paths were probably the only means for getting pedestrians from point A to point B. I do not profess to know the history of steps in urban settings, but I imagine they were built out of necessity. In most cases, one could imagine, due to limited remaining space and a large difference in elevation. And in these parts of a city, cars are often not permitted for obvious reasons. Stateside, San Francisco comes to mind first due to its hilly terrain and a street layout that works with, not against, the terrain. 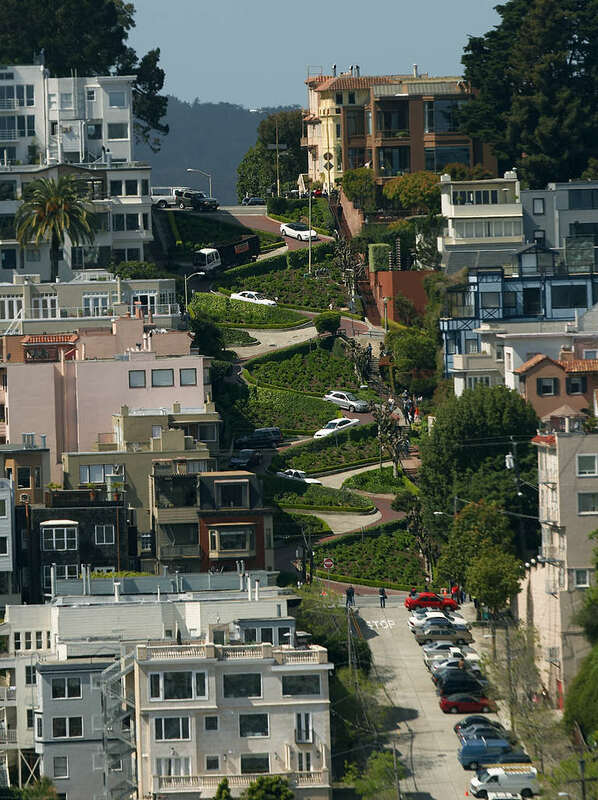 Although an amazing site with beautiful landscaping and a notable tourist destination, Lombard Street demonstrates the impractical nature, and some might argue, misuse of space, in trying to move automobiles through extremely steep spaces. In contrast there are a series of pedestrian-only ‘stairways’ that connect Jones and Taylor Streets in the Russian Hill section of San Francisco. In OpenStreetMap, these ways are tagged highway = steps. For more in San Francisco stariways see here. Many step streets are official streets and therefore can be found on the official City Map. For background context, the official City Map is a collection of Alteration maps. Alteration maps record changes to the City Map including public streets, parks and public places – see here for more information. Alteration maps of a corresponding area supersede all previous Alteration Maps from previous dates). 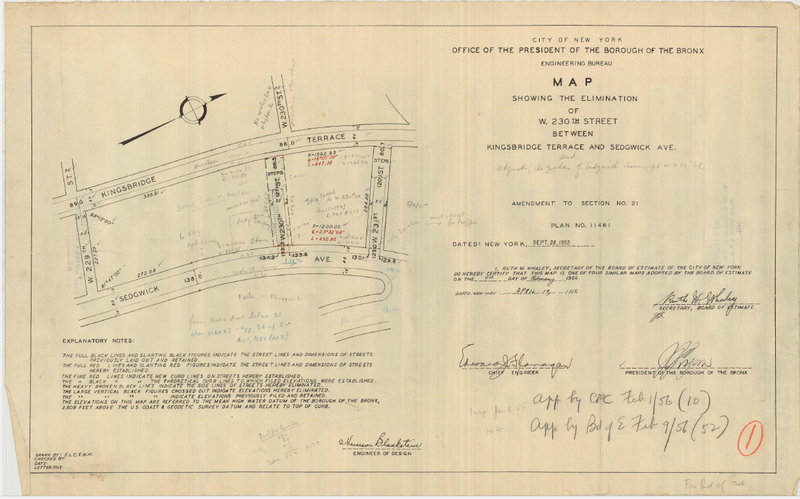 Below is a portion of an Alteration map from 1955 recording the elimination (de-mapping) of West 230th Street in the Bronx. This map shows both West 230th and West 231st Street labeled ‘STEPS.’ This label is most likely how the term step street started: as one might say as a cartographer’s annotation. Alteration Map courtesy of the Department of City Planning. To see the complete map click on the image. Step streets can also be found in NYC Open Data where the Roadway Type (RW_TYPE) is 7. One of the hilliest areas in NYC is northern Manhattan and the Bronx. And as one might expect that is where the greatest number of step streets are found. This is where you will find the densest clustering of step streets. And these are the ‘classic’ step streets (i.e., connect two streets). 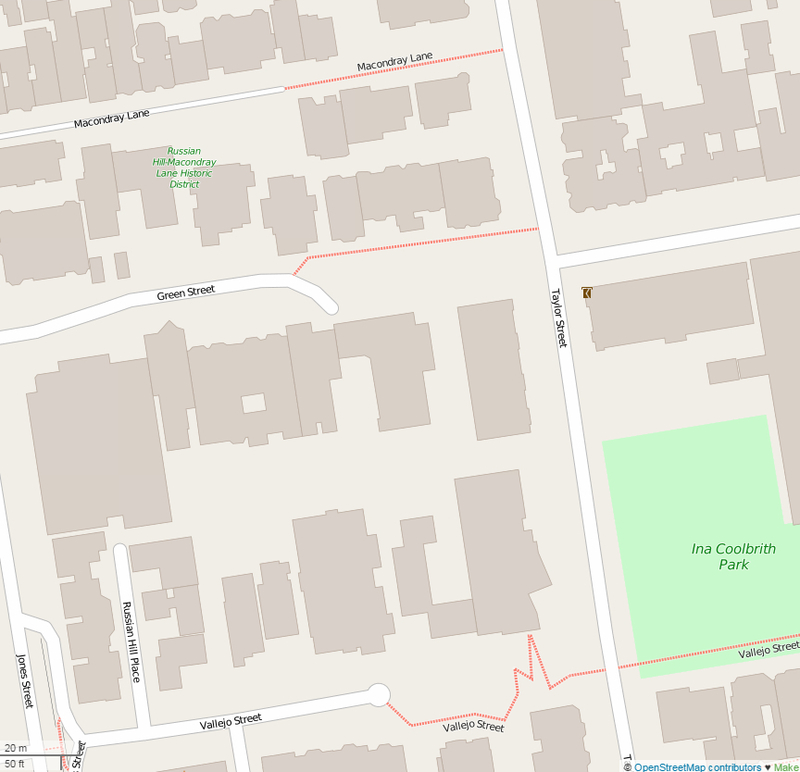 The example below connects two sections of Pinehurst Street in Manhattan north of W 181st Street. Based on the data, the longest step street is West 230th Street between Netherland and Johnson Avenue in the Bronx. A length of approximately 295′ with an elevation difference of 38′ for a grade of 12.9 percent. A relatively modest slope compared to the 26.8 percent grade of W 187 Street between Overlook Terrace and Fort Washington Ave also in the Bronx. The definition of a step street seems to have been expanded to include steps that connect streets to the boardwalks in the Rockaways. In any case, go ahead and download the data to explore these and other interesting anomalies or check out the map below. As is usually the case with development projects, pen must be put to paper first followed by a series of reviews and sign-offs before a shovel is put to the ground. That is also the case with street construction. 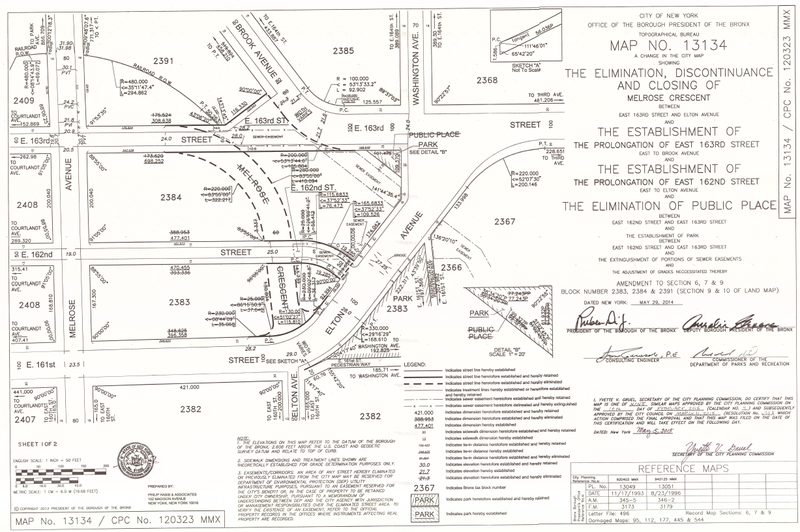 What is unique, however, is that a street must be added to a map before it is constructed. In New York City, a newly proposed street must be added to the official ‘City Map’ (not to be confused with NYCityMap) through the Uniformed Land Use Review Procedure (ULURP) before it can be constructed. Thus a street will exist on paper before it becomes a reality. These streets are what have become to be known as paper streets. Paper streets are not unique to NYC but ULURP is. Paper streets may exist on paper only for many years before they are ever constructed. The street’s configuration or name may change before construction takes place. There are even situations whereby a street could halted (de-mapped) – see definition below – before it ever becomes a reality. The dashed lines on the map below represent paper streets in the Midland Beach section of Staten Island. It is clear from the area that these infill streets are intended to complete the planned street grid when fully built out. However there could be circumstances (e.g., being in a flood zone) that prevent the streets from being constructed. 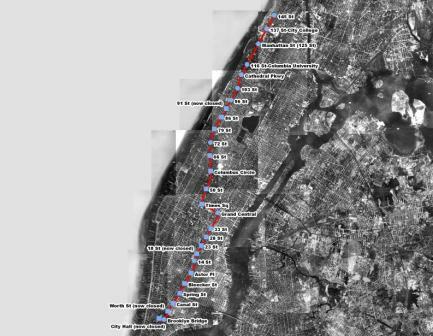 Although originally on paper only, paper streets can be found in NYC digital data. The NYC Street Centerline (CSCL) data set on the NYC Open Data Portal and City Planning’s LION data set include paper streets. For those wondering, LION is an extract of CSCL that includes both single-line (generic) and dual-line (roadbed) representation of the street network plus additional geographies. Additionally, LION has more fine-grained segmentation (breaks occur whenever geographies cross or there are unique address range breaks). Whereas, CSCL is focused specifically on the actual street (roadbed) representation with segmentation by block. More on these data sets in a later dedicated post. CSCL – STATUS values 3 and 9. The inverse of a paper street is a de-mapped street. As the name would apply, this is a case where a street was officially removed from the City Map. And as with paper streets, the street will appear on paper (City Map) as being de-mapped before they are actually removed. De-mapped streets can be found in LION where status equals 5. There seems to be no shortage of geographic anomalies in New York City (NYC). In this case I use geography in a non-academic sense, as a proxy for all that defines location: street and place names, addressing, jurisdictional divisions, etc. Having lived and worked here (NYC) for more years than I care to admit, nothing seems to shock me any more. And in hindsight, for a city as old (by U.S. standards) as NYC, the depth and breadth of geographic anomalies really should not come as a surprise. When you consider that NYC was originally separate cities, has developed over the course of separate administrations, and generations of city workers with their own ideas of standards and best practices, it sometimes seems shocking that there is as much geographic order as there is. But I digress. The latest addition, in what I have termed geographic anomalies, was brought to my attention by Rudy Lopez of the Department of City Planning. There is a development (i.e., network of streets) largely in Westchester County (our neighbors to the north) that extends into The Bronx and thus is part of NYC. Nothing out of the ordinary so far, but adding a bit of spatial intrigue, surrounding this development on all sides within NYC limits is Pelham Bay Park, the Hutchinson Parkway and the New England Thruway. 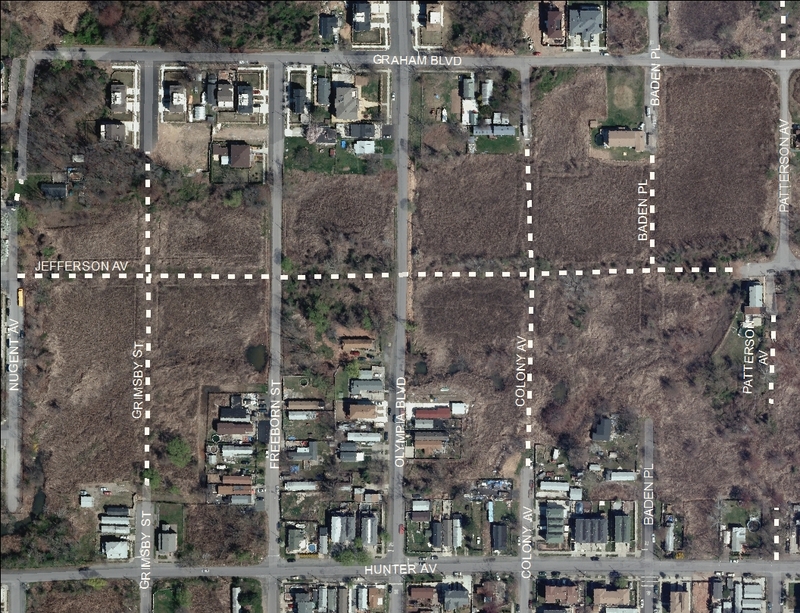 This has the effect of isolating the streets within this development (Park Drive bounded by Split Rock Road to the west and Edgemere Street to the east) from any other local road in NYC and thus creating the situation that you cannot enter this development in NYC any other way then through Westchester. Location from NYCityMap. Excuse the missing Westchester geography. And there you have it, yet another geographic anomaly in NYC. Where, in this case, you can only get here from there. The U.S. Constitution requires the redrawing every ten years of congressional and legislative boundaries (i.e., election districts) to account for shifts in population. This is referred to as redistricting. Concurrently, reapportionment is the redividing of a fixed number of seats in Congress (435) to be in proportion with a state’s population to the population in the U.S. As both of these efforts are based on population, they coincide with the U.S. Census Bureau’s decennial release of the federal census. New York State convenes a Legislative Task Force to aid the legislature in meeting its constitutional mandate. This effort was completed earlier this year and resulted in new election districts. These new election districts apply to this coming election as they define the areas the to-be elected officials represent. In advance of these newly elected officials taking office in January, NYCityMap will be updated with the new election districts. There are numerous resources for comparing the new and old election districts. One of which is an interactive map from the New York Times. Until then, NYCityMap will display the election districts for the currently elected officials. To see who is your elected official follow these instructions. To determine where to vote, use the Pollsite Locator. This site utilizes the new election districts to provide citizens their polling location based on the address of their residence. October 27, 2011, marks the 107th anniversary of the opening of the first section of the New York City subway. The line ran from City Hall to 145th St and Broadway, incorporating portions of what are now the IRT Lexington Av lines (4)(5)(6), the 42nd Street shuttle (S) and the IRT Broadway-7th Av lines (1)(2)(3). Although there had been elevated lines in Manhattan and Brooklyn operating as early as the 1870’s, the new subway was the first to be built underground with the exception of one station that was elevated. The diagonal portion of W. 125th St (then known as Manhattan St) runs along the bottom of a valley and it was deemed more practical to build this station above ground. The semicircular bridge span at 125th St and Broadway is today a registered landmark. Four of the original stations are now closed – at City Hall, Worth St and 18th St on the east side, and at 91st St on the west side. The City Hall station, a beautiful example of vaulted architecture closed since 1941, can still be viewed by riding a southbound (6) train around the loop south of Brooklyn Bridge-City Hall station. Note that the stations at Grand Central (express) and Times Square (local) are today used by the 42nd Street shuttle (S) line, although the platforms and tracks have been altered since the IRT assumed its current “H” arrangement (complete trunk lines on the east side and west side) in 1918. The above map shows the original subway line over the 1924 Aerials. As a follow up to the Tying the Knot post, some of you may be looking to capture your special day with pictures or video. Clearly, the scene should be memorable and attractive and what could be a better backdrop than a scenic fountain?!? For those getting married at the Manhattan office of the City Clerk, the fountain in City Hall Park is just a few blocks south and would be the perfect photo op for the newlyweds! Of course there are many other famous fountains in New York, the fountain in Washington Square Park, Bethesda Found in Central Park (said to be the inspiration for the introduction to the television show “Friends”), Pulitzer Fountain in Grand Army Plaza-Manhattan (rumored to have been visited by F Scott Fitzgerald and his wife for moonlit dips), Bailey Fountain in Grand Army Plaza-Brooklyn, Rockefeller Fountain in the Bronx Zoo, The Uni-sphere in Flushing Meadows Corona Park in Queens and South Beach Park’s Dolphin Fountain in Staten Island to name just a few. With wedding season well underway, the summer is the perfect time to get married in New York City. Getting married in the city is so popular, in fact, that NYC Media has dedicated a whole show to the topic, “Say I Do, NYC”. Our friends at NYC Media provide ten helpful hints and services provided by the City Clerk’s Marriage Bureau including getting a marriage license, holding your ceremony at the City Clerk’s office, information on language translation and of course, where the clerk’s offices are.